Alexandre Marc (19 January 1904 - 22 February 2000) was born as Alexandre Markovitch Lipiansky in Odessa, Russia in 1904. He later simplified his name by dropping Lipiansky (which his sons have reclaimed) and modifying his father’s first name to Marc which he used as a family name. His father was a Jewish banker and a non-communist socialist. Alexandre was a precocious activist. He was influenced by his early reading of F. Nietzsche, especially Thus Spoke Zarathustra. He started a non-conformist student journal while still in secondary school during the Russian Revolution, asking for greater democracy and opposed to Marxist thought. This led to death threats made against him by the Communist authorities. The family left Russia in 1919 for France but not before Alexandre had seen some of the fighting and disorder of the Russian civil war. These impressions left a deep mark, and he was never tempted by the Russian communist effort as were other intellectuals in France who had not seen events close up. During part of the 1920s, Marc was in Germany studying philosophy where intellectual and philosophical debates were intense after the German defeat in the First World War and the great difficulties of the Weimar Republic. He saw the forerunners of the Nazi movement. Marc was always one to try to join thought and action, and he had gone back to Germany in 1932 to try to organize anti-Nazi German youth, but ideological divisions in Germany were strong. The Nazi were already too well organized and came to power the next year. Marc, having seen the destructive power of Nazi thought, was also never tempted by Right Wing or Fascist thought. Seeing the destructive potential of both Communist and Fascist thought and sensing the deep crisis of Western civilization, Marc was looking for new values that would include order, revolution, and the dignity of the person. There was no ready-made ideology which included all these elements, though two French thinkers — difficult to classify — did serve as models to Marc and t Denis de Rougemont and some of the other editors of L’Ordre Nouveau: Charles Péguy and J Proudhon . Marc wrote a book on the importance of Péguy at the start of the Second World War. Marc was living in Aix-en-Provence at the time, and the book was published in still unoccupied Marseilles in 1941. He also met in Paris Nicolas Berdiaeff, Jacques Maritain and Gabriel Marcel. It was from these meetings that the personalist doctrine of L’Ordre Nouveau was born. The rallying cry of personalism was “We are neither collectivists nor individualists but personalists …the spiritual first and foremost, then the economic, with politics at the service of both of them”. Alexandre Marc seemed destined to use words which took on other meanings when used by more popular writers. The name of the journal L’Ordre Nouveau was taken over after the Second World War by a French far-right nationalist movement influenced by a sort of neo-Celtic ideology and was widely known for painting Celtic cross graffiti on wall in the days before graffiti art filled up all the space. Revolution, especially after the Nazi-Fascist defeat, could only be considered in the broader society in its Marxist version. Person, which as a term had been developed by the Roman stoic philosophers could never carry the complexity of meanings which Marc, de Rougemont, and E. Mounier wanted to give it. The Jewish philosophers Martin Buber and Emmanuel Levinas also used the term “personalism” in the same sense as Marc, but their influence was limited to small circles. In fact, “individualism” either seen positively or negatively, has returned as the most widely used term. In some ways, this difficulty with the popular perception of words exists with the way Marc uses “federalism” by which he really means "con-federalism". Alexandre Marc and Denis de Rougemont met again in Switzerland at the end of the Second World War when de Rougemont returned from spending the war years in the USA. They started reconnecting people whom they knew in the pre-war years who also saw the need for a total reformation of European society. 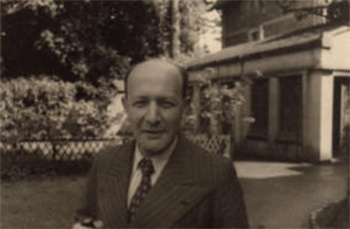 Both de Rougemont and Marc were good organizers of meetings and committees, and they played an important role in 1947 and 1948 setting up the first meetings for the foundations of the European movement and the European federalists, especially the August 1947 meeting at Montreux, Switzerland in which world citizens and world federalists were also present. Both men stressed the need for education and highlighted the role of youth to move European unity beyond the debates of the 1930s and the start of the Cold War, though both continued to stress the importance of the themes which brought them together in the 1930s. They were both founders of centers for the study of European federalism and an exploration of European values. It was in the context of seminars and publications of the two centers that I worked with both in the 1970s. Culture in the philosophical sense was crucial for both, and their efforts in Geneva and Nice were rather similar. Marc and de Rougemont had a personal falling out that lasted nearly a decade, due, it seems, to the tensions surrounding the break up of de Rougemont’s first marriage. But even during this break, de Rougemont always spoke to me highly of Marc and his ideas. De Rougemont knew that I was seeing Marc and had an interest in the intellectual currents of France in the 1930s. The two men came together again later, especially after de Rougemont’s happy second marriage. From his death bed, de Rougemont spoke to Marc on the telephone concerning the need to reprint the issues of L’Order Nouveau since the articles were still important. The reprinting has been done since. Both de Rougemont and Marc shared a distrust of European integration as it was being carried out within the European Community and later the European Union Both men stressed the need for local democracy, and shared a strong distrust of the politicians prominent in the nation-state system. De Rougemont went on to give most of his attention to the role of regions, especially the trans-frontier Geneva area which combines part of Switzerland and France and is an economic pole of attraction for the Italian Val d’Aoste. Marc continued to stress what he called “global” or “integral” federalism, a federalism with great autonomy and initiative at every level as over against “Hamiltonian” federalism which he saw as the creation of ever larger entities such as the United States, whose culture and form of government Marc distrusted. Marc remarked that ‘Hamiltonian federalism’ as a whole was turning its back on spiritual, cultural and social questions and devoting itself to a form of action that can be defined as ‘political’ and underlined the contradiction that is inherent in the lobbying of governments on federalist issues. De Rougemont was the better writer. His last book The Future is within Us, though pessimistic, especially of political efforts, remains a useful summing up of his ideas. (2) Although Alexandre Marc wrote a good deal, his forms of expression were too complex, too paradoxical, too filled with references to ideas which are not fully explained to be popular. Marc’s influence was primarily verbal as stimulant to his students. Having seen early in his life the dangers of totalitarian thought, he always stressed the need for dialogue and listening, for popular participation at all levels of decision-making. As with ‘order’ ‘revolution’ ‘the person’, ‘federalism’ was probably not the term he should have chosen to carry the weight of his ideas. The other Alexander — Hamilton — has infused the word ‘federalism’ with the idea of unification of many smaller units. ‘Popular participation’ is probably a better term for Marc’s ideas, if the word ‘popular’ could carry the complex structure which Marc tried to give to the word ‘person’. Con-federation is probably the better term for the de-centralized administrative structures that Marc proposed.